The more stocks you buy the bigger the piece of the company you own. If the company becomes popular, many people will invest their money, buy more stock, and the price of the stock will go up. If the company becomes unpopular, the stock price will drop. Bonds are different from stocks. Bonds are loans, usually made to your city, state, or the federal government, that are repaid with interest at a certain date in the future. 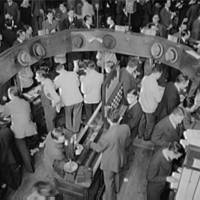 Can you guess how the trading of stocks and bonds started?